During the early spring of 1979, tensions between Saudi Arabia and the People’s Republic of Yemen were strained to the point where the US intelligence community’ believed that the Republic was on the brink of invading its northern neighbour. As a result, on the morning of Monday 12 March, Majs Rich Graham and Don Emmons deployed 972 from Beale to Det4 inorder to furnish deci­sion makers with the necessary intelligence information. After two early morning ground aborts due to cloud cover over the ‘collection area’, the mission finally got underway. Buzz Carpenter and his RSO, John Murphy got airborne and headed for their ARCP off Lands’ End. Unfortunately, Buzz suffered a violent attack of diarrhoea while on the tanker boom, but despite his discomfort, he elected to continue the mission. Having completed the full fuel off-load they accelerated due south; since France had denied them the right to overfly, it was necessary to skirt the Iberian peninsula, entering the Mediterranean Sea through the Straits of Gibraltar. They then complet­ed a second refuelling before returning to high Mach flight and overflying the Suez Canal, before a third tanker rendezvous over the Red Sea. The planned double-loop coverage of the collection area was interrupted by the ANS, which tried to initiate a pre-programmed turn pripr to reaching the correct destination point (DP). Recognising the error, the crew flew the aeroplane manu­ally while trying to work out what had caused the AUTONAV ‘glitch’. As a result of the miscue, they over­shot the turn point, but completed the rest of the route and made their way back to the tankers for another Red Sea top-up. A fifth air refuelling was completed east of Gibraltar and an hour-and-a-half later they recovered ‘972 back to Mildenhall after a full ten-hour mission. This mission had generated considerable interest within the 9th SRW as well as at SAC Headquarters and in Washington. As a result, Buzz and John were greeted by a large number of their colleagues as they stepped off the gantry (including Col Dave Young, the 9th SRW vice commander), who presented Buzz-with a brown SR-71 tie tack to commemorate the in-flight incident when, to mis­quote a well known phrase, ‘the world fell out of Buzz’s bottom’. When the ‘take’ was processed, it was of exceptional quality and the incident which had delayed their turn had yielded the most important information. That unexpected success made additional flights to the area unnecessary. Consequently, Rich Graham and Don Emmons returned 972 to Beale on 28 March. Deployments to Suffolk continued throughout the early eighties, the main ‘collec­tion areas’ being the Barents and Baltic, in support of US Navy intelligence requirements. On 9 July 1983, British aviation enthusiasts ‘manning’ the many off-base vantage points of Mildenhall noted the arrival of aircraft ‘962, an aircraft that had ‘pulled’ TDY at the base on previous occasions. In fact Majs Maun’ Rosenberg and ‘ED’ McKim had just completed a seven hour operational flight from Beale to Mildenhall via the Barents/Baltic areas in the Palmdale flight test aircraft ‘955. The false serial number had been applied to ensure unwelcome attention was not drawn to the unique operational test deployment then undenvay. In its detachable nose section, ‘955 was equipped with Loral’s Advanced Synthetic Radar System (ASARS-1), a system that provided a quantum leap in radar resolution. 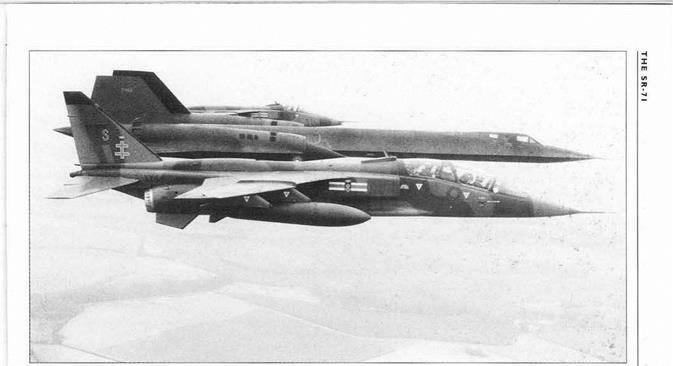 With maritime data collected during the inbound flight, Majs ‘BC’ Thomas and John Morgan conducted a 2.6 hr ASARS operational test sortie of land-based targets in East Germany nine days later. On 21 July, Maury and ED took their turn on a four hour mission. The final ASARS operational proving flight was conducted by BC and John on 30 July, when they flew ‘962, ie ‘955, on a 7.3 hr flight back to Beale, again via the Baltic and Barents Seas. The series of tests were extremely success­ful and following further tests back at Palmdale, two production radar sets for the operational fleet were fund­ed and deployed.